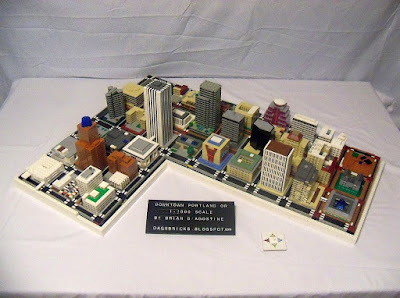 A slow day at work got me to wondering if I could build downtown Portland, Oregon in LEGO at 1:1000 scale. Portland's blocks are small at 200x200'. I pulled out the abacus and did the math. An 8x8 stud plate would work for the blocks and actually computes to 1:960 scale. Close enough. This scale means that a 1x1 tile has dimensions of 25x25' and 10' tall. Big tile. The streets are another matter. Many of Portland's streets are 60' wide running east-west and 80' wide running north-south. This width includes the sidewalks. After several attempts I decided to build the streets sideways. This would allow for a 50' street to be same width as 2 studs. Close enough. As for the 80' streets they could be built similarly but with an extra plate on each side for 70'. Clo-... you get the point. To take up the slack the blocks would be 8x9 studs with the extra plate going into the block on either side. This gives me a half plate of clearance (1/4 plate each side) for relief in which to place the modularly built buildings. It's a lot of math and technical stuff but the point is, it works really well. Another issue came about and that is the gentle slope of downtown. Many streets fall or rise 10' between blocks. The elevation change is subtle but noticeable in real life. I wanted to capture this topography. After countless attempts I discovered the 1x1 plate with the thin ring. When built into the streets and turned sideways it could handle a tile on top of the ring for the intersection. Besides that there is enough play in the tolerance of parts that a 1 plate difference in height over 8 or 9 studs is easily conquered. Turning the ring plate sideways means that I've got studs going up and down. The up studs hold the 2x2 tile for the intersection. The down studs go into a 2L technic liftarm which then rights the studs to going up again. Most of the pillars for the streets are built out of 2x2 bricks and plates. Due to the 8x9 stud blocks with 2 stud wide streets in the middle, standard 32x32 stud baseplates are not quite sufficient. Ideally I need baseplates that measure 30x33 studs. Careful alignment of edges resulted in needing to only trim 4 studs off of every other baseplate provided that I attached several together. The 33 stud requirement going the other direction gets reset at the half wide Park Blocks. All in all it works out very well. Each baseplate holds a quad of nine blocks. (Don't lecture me on quad vs nine. I'm using linguistic liberties here. What do you want me to say, a "non"?). The first quad was determined by the building that I was working in at the time I started actually building. This area is bounded by SW 4th Ave, SW Broadway, SW Market St, and SW Jefferson St. It contains one of the tallest high-rises in Portland, the Wells Fargo tower. From this point I am working north towards W. Burnside St. and east towards the river. At some point I will reach out towards the hills and the I-405 freeway. Ultimately my boundaries are the Willamette (will-A-mit) River, W. Burnside St, and the I-405 freeway. This area will take the entirety of a 4x8 sheet of plywood. After that I may explore NW Portland or the Inner Eastside. If I get that far. Two quads (18 blocks) were displayed at Bricks Cascade 2013 and won the Best Microscale trophy. In 2014 at three quads I caught the attention of the media. For 2016 I had built out to 4 quads. You can see my slow progress below. See http://www.oregonlive.com/front-porch/index.ssf/2013/07/public_notice_calls_proposed_a.html for the 'before and after'. I was told about a few other changes to downtown since some of these buildings were snapped together. A lot has changed in the two years since I worked down there. By the way, I love Pioneer Courthouse Square! Even the 'awning' next to Starbucks comes through wonderfully! You even got those "tri-round apartments" to look right. The more I look at the small details, the more impressed I get. Pioneer Courthouse is my least favorite due to the inability to do good rounding for the seating but I'm glad you like it. I worked next to the Portland Plaza (tri-round apartments) for years and got a good look at them every day. Thank you for your kind words.